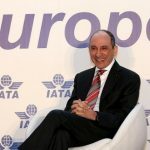 Qatar Airways Group Chief Executive, His Excellency Mr. Akbar Al Baker, today spoke passionately about the challenges facing the aviation industry in Europe at the International Air Transport Association (IATA) Wings of Change conference held in Madrid. In his capacity as the Chairman of IATA, H.E. Mr. Al Baker attended the conference and participated in a quick-fire question and answer session moderated by BBC presenter Ms. Babita Sharma. H.E. Mr. Al Baker said: “Aviation growth has shifted to geographical areas outside the EU such as the Asia-Pacific and the Middle East in recent years, and the European Commission has been very proactive in pursuing comprehensive air transport agreements with ASEAN, Qatar, Turkey, Azerbaijan, Armenia, and Tunisia. In my view, it is very important for EU air carriers to capitalise on the growth opportunities offered in emerging aviation markets. “EU carriers should also reinforce their global position by offering greater connectivity to EU citizens and foreign travellers alike, as many European capitals remain top in-bound tourism markets for global tourism. In the long run, participation of EU carriers through the conclusion of comprehensive air transport agreements is key to ensure the competitiveness of the EU aviation sector. Mr. Rafal Milczarski, CEO of LOT Polish Airlines, Mr. Luis Gallego, CEO of Iberia, and Mr. Carsten Spohr, Chairman and CEO of Deutsche Lufthansa, also joined the ‘CEOs on the Spot’ session, and were quick to share with the audience an inside view of the industry and what it takes to make an airline successful. Following the success of the Wings of Change concept, which originated in Latin America, IATA has brought the conference to Europe for the first time and will potentially continue to expand the brand’s reach to other markets in the future. The two-day event brings together airline CEOs, Ministers, and industry experts to discuss the current state and future of air transport. 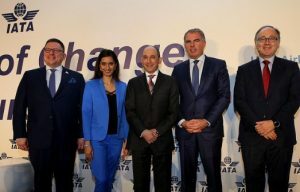 IATA Wings of Change takes place at a critical time for the industry as it contends with an unprecedented increase in demand, capacity bottlenecks in the air and on the ground, and looks to harness the many opportunities of the digital revolution. Key topics on the agenda include Innovation, Safety, Security, Sustainability, Diversity and Aviation Competitiveness. H.E. Mr. Al Baker assumed the position of IATA Chairman on 5 June 2018 and will maintain the position for a one-year term. IATA is the trade association for the world’s airlines, and represents some 290 airlines or 82 per cent of total air traffic and supports many areas of aviation activity, as well as helping to formulate industry policy on critical aviation issues. Qatar Airways currently operates three daily flights to Madrid from Doha, 18 flights a week to Barcelona and a four-times-a-week seasonal service to Málaga from June to September.